In this Article, We will start with a basic Comparison between common types of Oral Ulcers. The comparison will be in the Etiology , on the preceding lesion before the ulcers occurs and Recurrence. But first, we must understand what is an Ulcer. 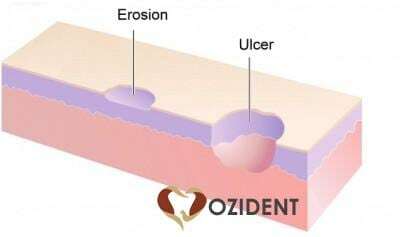 In The Comparison and previous image, the difference between an ulcer and erosion is quite easy to understand. Definition: an Ulcer that is preceded by a vesiculobullous lesion. Non – Acantholytic: Death and rupture of groups of epithelial cells. Acantholytic: Destruction of intercellular attachments.